Here’ s good lesson for you to NOT use dryer sheets with DRI-FIT clothing. Thank me later for doing this, so you don’t have to make this mistake. An accident occurred, in which my brand new Nike Dri-Fit shirt was dried with a dryer sheet. We are actually getting RID of dryer sheets, and we normally hang our Dri-Fit wear to air dry… so this was a very unfortunate happening. Within 30 minutes of my workout Saturday, my arm pits were itching. I just thought I was hot… or something was rubbing. My crazy immune system went into over drive…. When I took my shirt off – I knew I was in BIG trouble… hives had set in and were taking over!! I’ve tried coconut oil lotion and some aloe plant (Which feels great but it’s drying it enough). Wearing a tank top isn’t really an option this time of year – but I’ve just been trying to let it breathe and keeping it dry. No. This won’t be happening again. 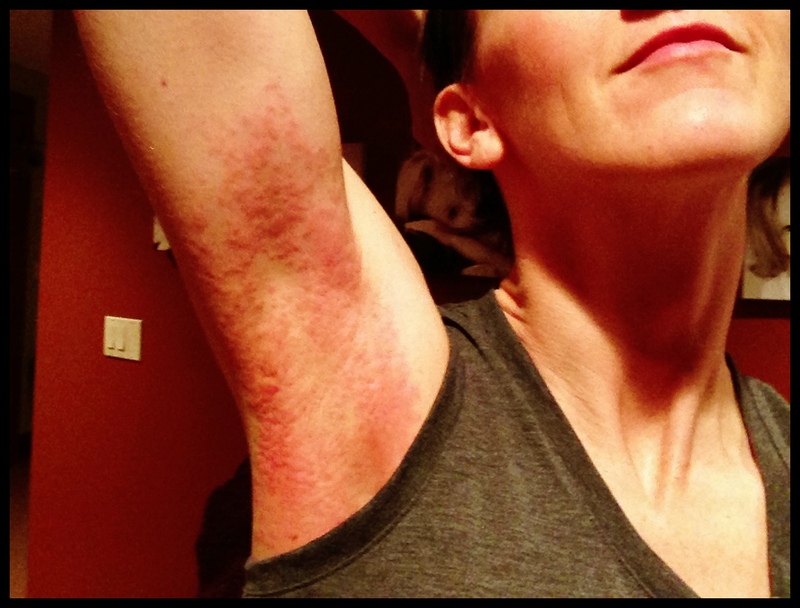 I will say, given everything I’ve experienced – a rash isn’t the end of the world… but please pray it goes away SOON!! Thanks! If you don’t think that “smell good” stuff in dryer sheets isn’t a chemical on your skin. Think again. Posted on March 12, 2013, in Celiac/Gluten Sensitivity, Our Struggles and tagged Dri-Fit dryer sheets + gluten intolerance + armpit rash + gluten intolerance + celiac disease + healthy for him. Bookmark the permalink. 4 Comments. Yikes, hope it gets better soon! I started taking some “NOW” brand Quercetin with Bromelain (a nautral anti-histamine/anti-inflammatory)… and I think they are improved some today. Ahhhh…. thankful for my aloe plant! Thanks for posting this. Been trying to figure out where my pit rash came from to no avail. After reading your post, a little investigation with my wife revealed that she’d recently changed dryer sheet brands. I’m soooooooo sorry— been there done that bought the t-shirt–we only use white vinegar as our fabric softener now— hope you are doing better— it is the pits having the hives for everything— blessings to you my friend!!! !